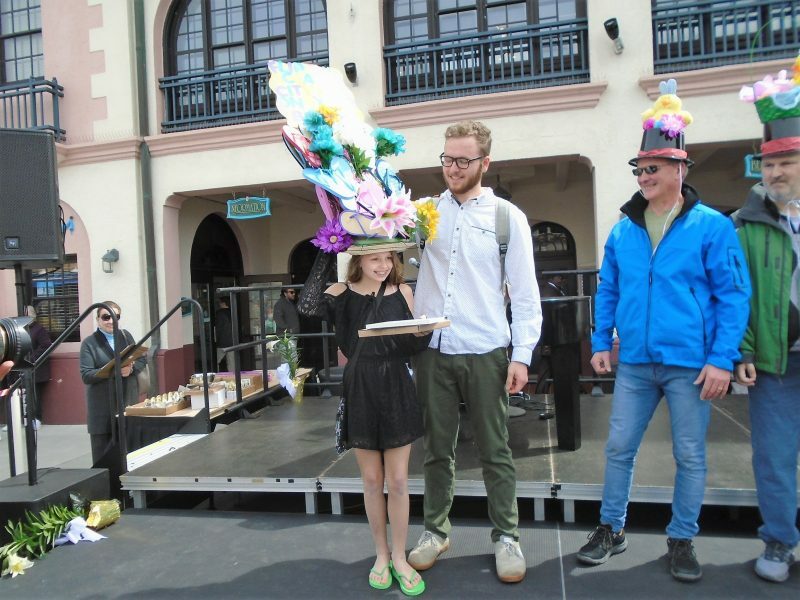 Siblings McKenzie Whilden and Ben Merrifield, center, both of Somers Point, put on their Easter best for the Ocean City Easter Fashion Promenade in 2018. 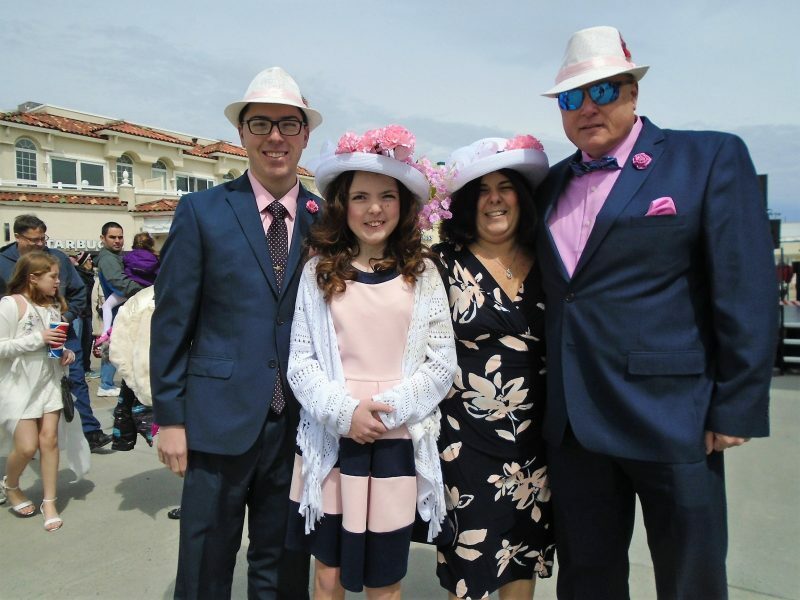 When it comes to the Easter Fashion Promenade in Ocean City, the Dole and Curran-Smith families turn to their most fashion savvy family member. Doles’ two daughters Devon and Kelly and her granddaughter Mia love being in the show. But it is Devon who works out the details of what to wear. She corresponds with relatives who come for the holiday from Las Vegas. All the details pass through Devon, from the wardrobe colors to the accessories, so everyone is color-coordinated and ready for the big day. 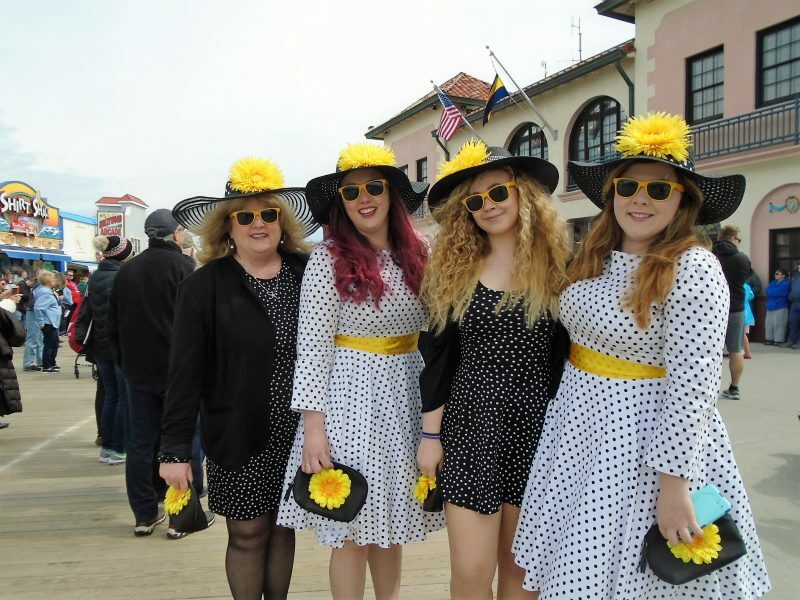 Kathleen Doles, daughter Kelly, niece Mia and daughter Devon Doles, of Absecon, show off their brightest Easter fashions. And every year the family makes it a point to wear something eye-catching. They did just that this year and then some. The wardrobe consisted of polka-dots, a lot of yellow and black material and even matching bright yellow-shades and giant yellow flowers either adorning a bonnet or as a hair accessory. Aiden Curran-Smith, 11, of Las Vegas, was ready for a little friendly competition. He decked out in a yellow bowtie, big yellow shades and bright yellow suspenders. But the Dole and Curran-Smith families weren’t the only ones turning heads at the event. 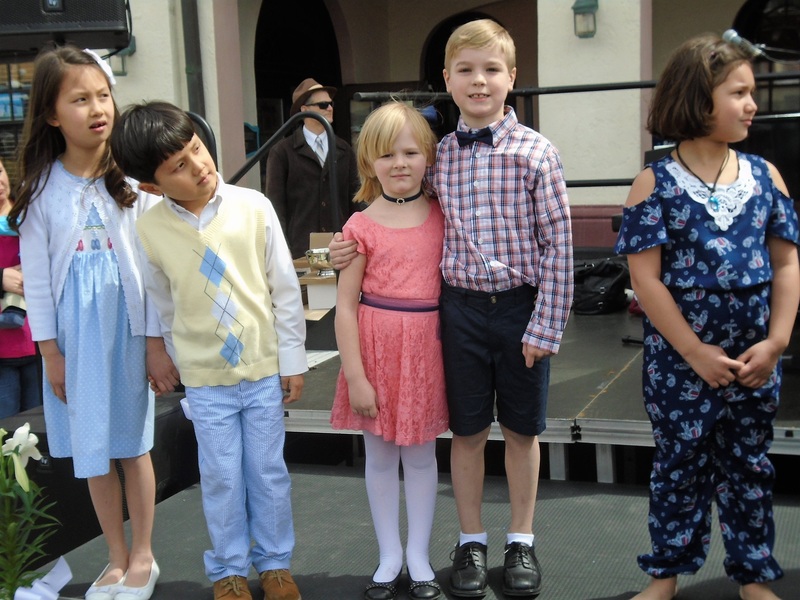 Children from newborn up to teens and adults graced the stage for the different categories with one main theme: looking your Easter best. 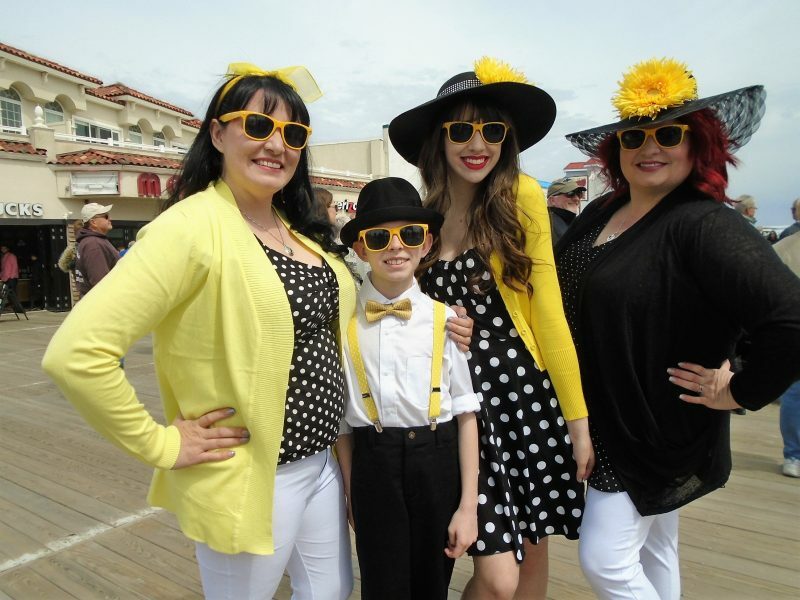 The Curran-Smith family includes Kim, Aiden, Celeste and Mitchie, of Las Vegas, enjoy visiting their relatives, the Doles and heading to the Easter show every year. The sun came out at the beginning of the show. Residents and tourists flocked to the Boardwalk Easter afternoon making it appear more like a summer day. 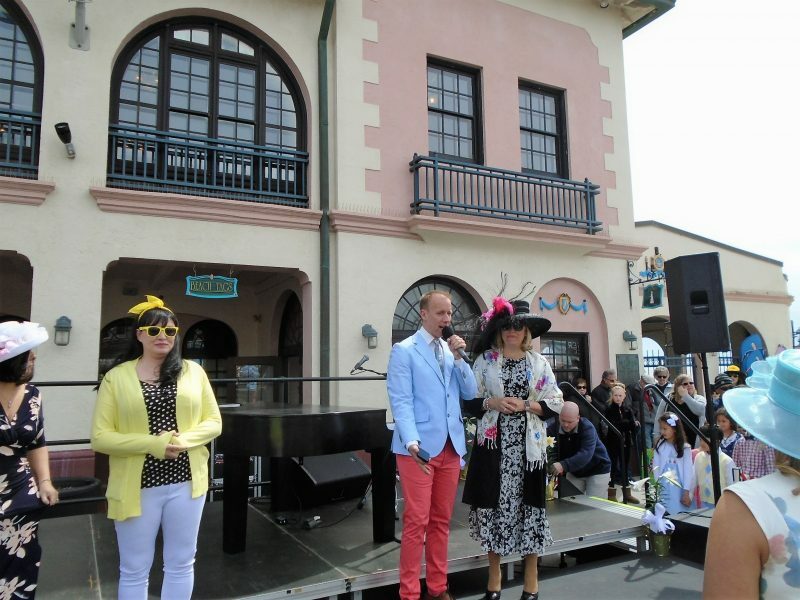 Crowds watched the Dueling Pianos show prior to the Easter fashion show. 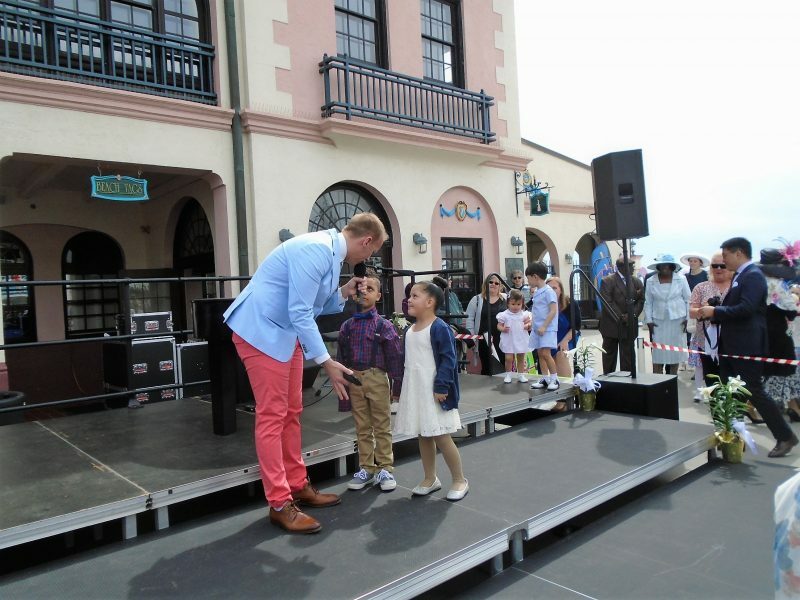 The musical performance entertained crowds again when the fashion show was finished. Emcee Michael Hartman kept the spectators and contestants entertained as he made jokes and poignant small talk about choice of outfits and other things. 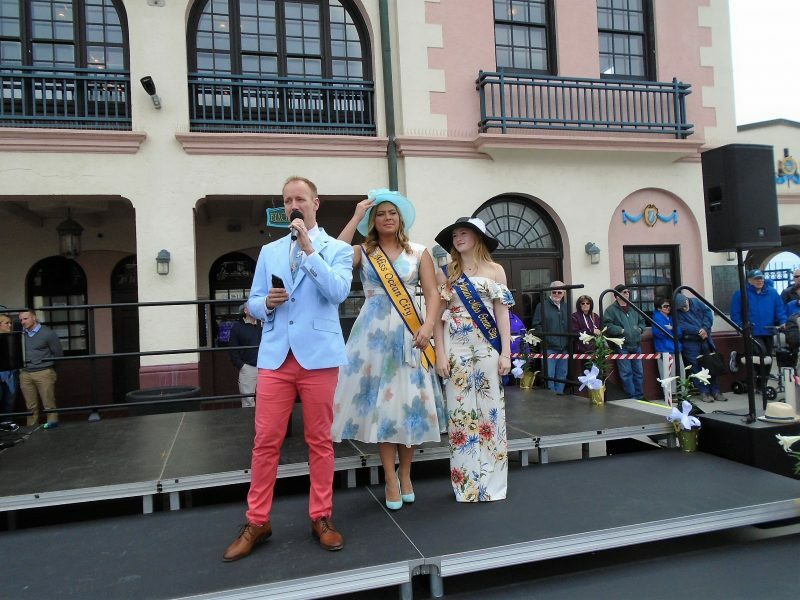 2018 Junior Miss Ocean City Hope Aita and 2018 Miss Ocean City Madison Leigh Kennelly were the fashion show judges. Emcee Michael Hartman has fun entertaining the contestants and the crowd with his witty humor. “The cool thing about this show is it is a tradition in Ocean City, with just the right mix of the past with the future,” Hartman said before the show began. Hartman kept the light and entertaining event going with his quick wit and repertoire with all ages of contestants. At one point, he told a little boy who was about 4-years-old, that he looked like singer-songwriter Bruno Mars. The audience laughed, and the little boy grinned at the extra attention. 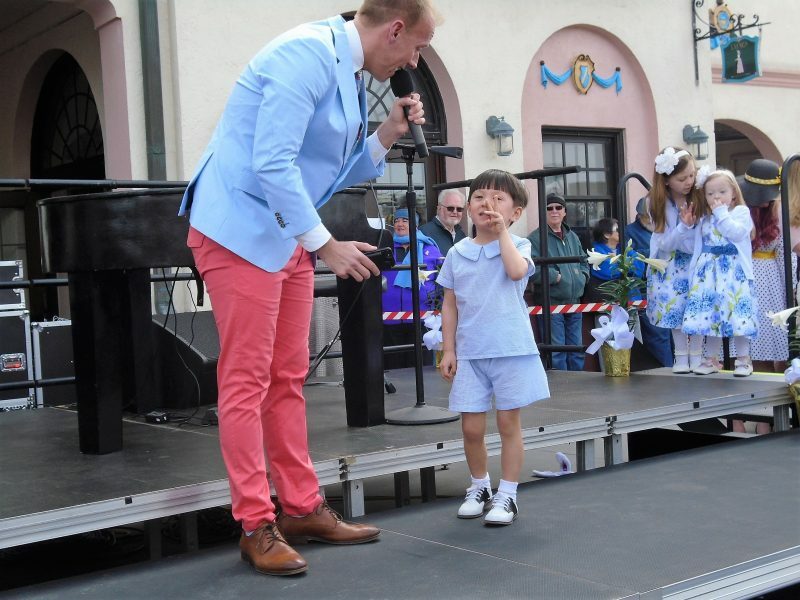 Like the Doles and Curran-Smith families, other families were clad in their festive Easter attire Sunday to join in the show because it has become an important and fun family tradition. From left; the Phillips family of Philadelphia; William, his sister Maria and parents Florence and Bill took their color coordination to a new level with blue as the main theme. 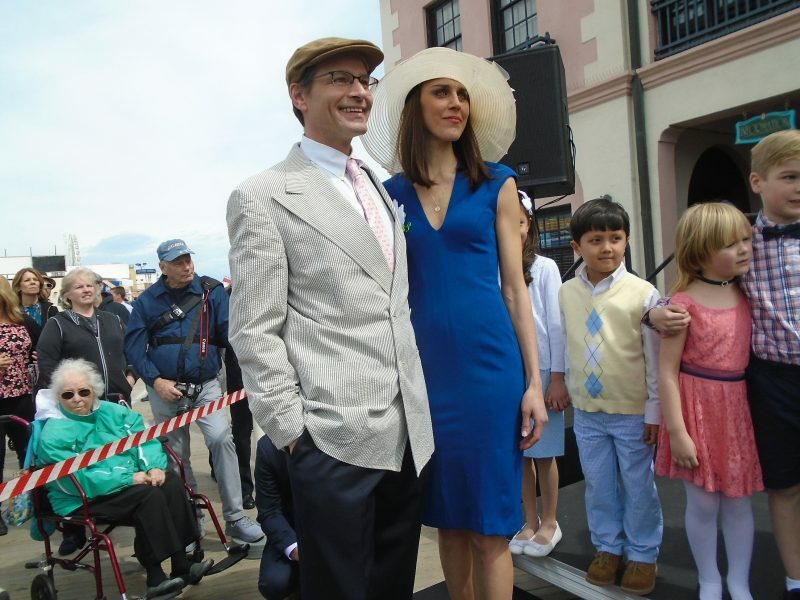 Bill and Florence Phillips make the Easter Fashion Promenade a staple to their holiday. Every year the Philadelphia couple and their teenagers Maria and William color-coordinate their outfits to grace the stage. “We went to shop for clothes and he had a blue suit, so we went with blue,” Bill Phillips explained, as the main color in the family’s attire. They made a good choice, since Maria Phillips went away winning Best Dressed Teen Female. Elton and Kim Anglada, of Ocean City, took turns keeping up with 3 ½ year-old son Chance, who didn’t want to stay in one place, while the other parent held 1 ½ year-old daughter Felicity. Elton wore a brown pinstriped suit with a pink tie. Kim opted for a pale pink dress. Chance wore a straw hat, beige pants and suspenders, while they had the baby in a floral dress. The family did the show last year and plan on doing every year, they said. 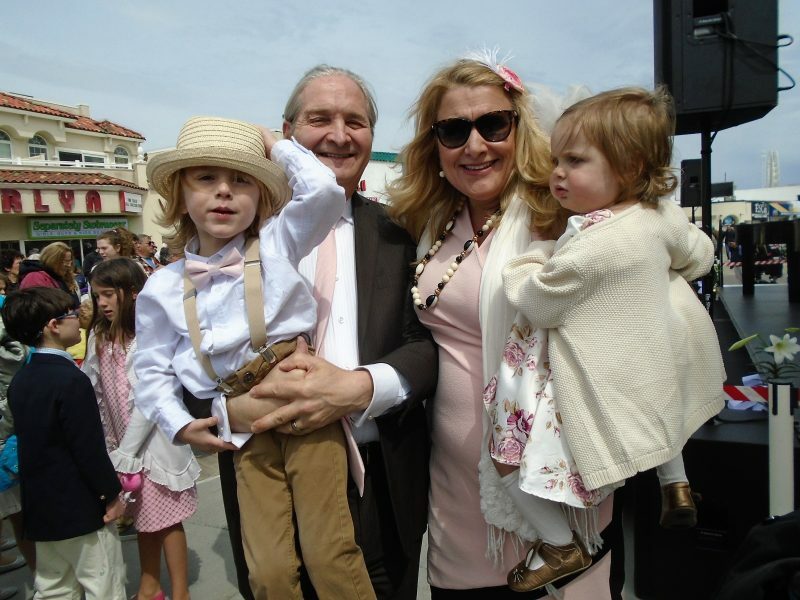 For Kristina Merrifield, son Ben Merrifield, 8, and daughter McKenzie Whilden, 6, of Somers Point, there was definitely something missing from last Easter’s festivities. “They couldn’t be in the show because they went to an Easter egg hunt instead,” Kristina Merrifield said. So, the siblings, who had won Best Dressed Couple in 2016, decided they better get back to the promenade and that they did. “I put a blue belt on McKenzie to match Ben’s suit,” Kristina proudly explained. Both McKenzie and Benjamin appeared comfortable in front of the crowds smiling and posing for photos. Brianna DeCicco, 2, brother Carlo, 1, and dad Will DeCicco, of Mays Landing, pose for the crowd. 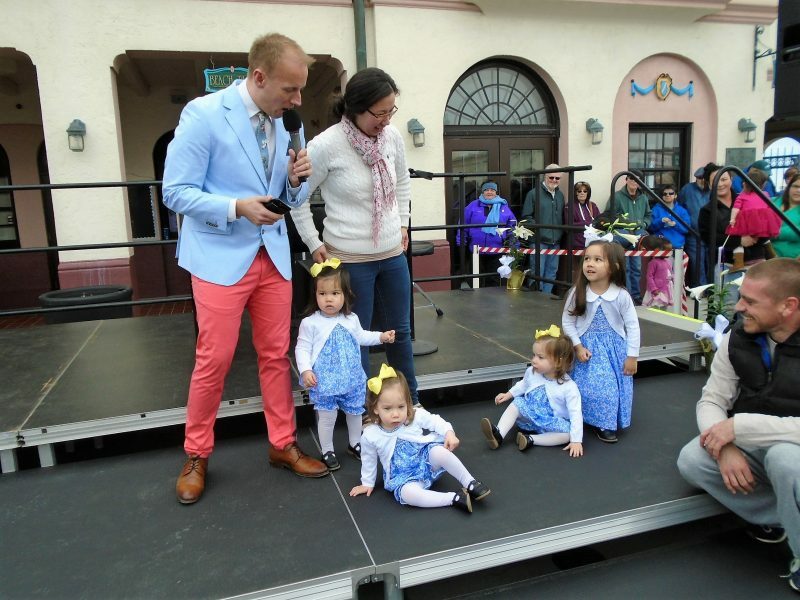 The DeCicco family, of Mays Landing, made the show a real family affair, with some beauty pageant contenders possibly in their future. 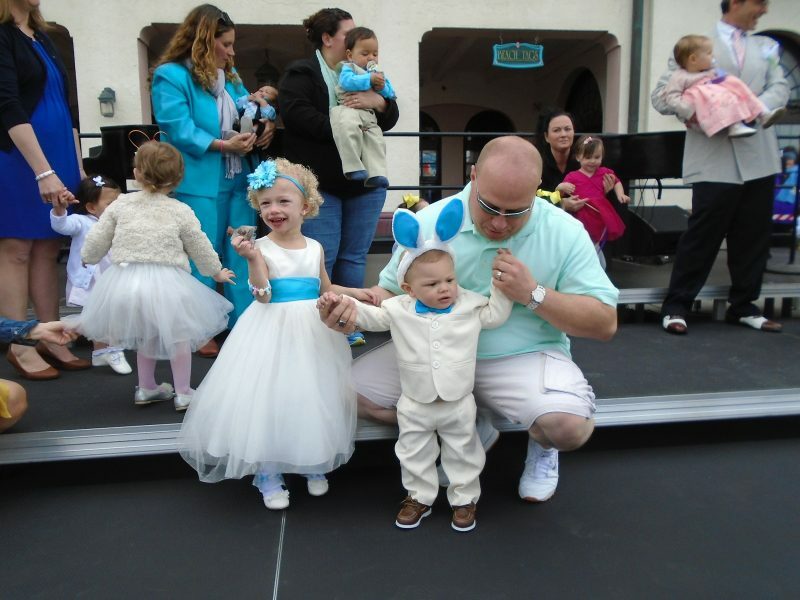 Brianna, 2, and Angelina, 5, DeCicco took to the stage, as did their baby brother Carlo, 1, with the help of course of dad Will DeCicco. 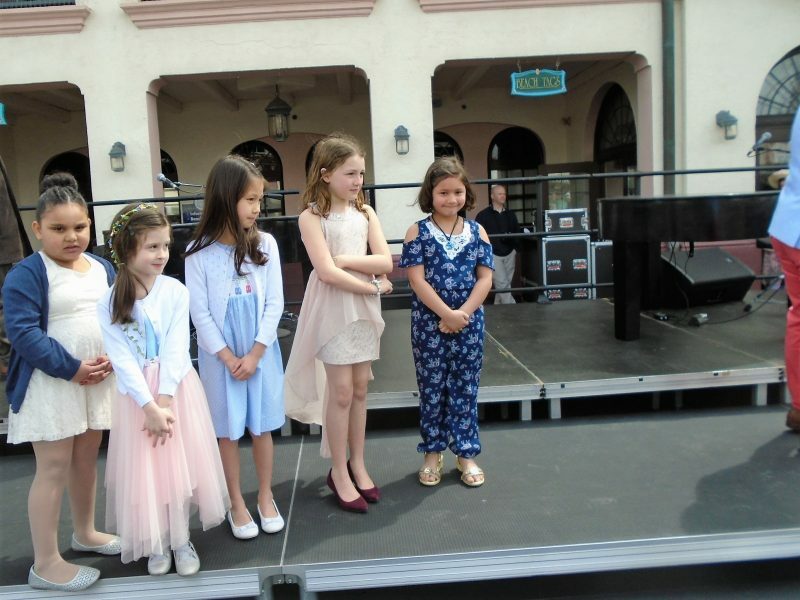 Brianna managed to hold a half-eaten chocolate bunny near her pale dress on stage, without getting a smudge on it, while Angelina sat poised smiling for the crowd. Angelina DeCicco, 5, of Mays Landing, gives the audience her best smile. The full list of winners is as follows; Everyone wins in divisions newborn to 2 years old, 3 to 5 years old, 6 to 8 years old and 9 to 12 years old. Best Dressed Teen Male went to Ben Miller, 14, of Newtown Square. Maria Phillips of Philadelphia took Best Dressed Teen Female. Best Dressed Gentleman went to Austin Sedicum from Bucks County, Pa. and Best Dressed Woman went to Lori Lawrence of Ocean City. Best Dressed Couple went to Pleasantville residents Cora Wright and Henry Smith. For a second year in a row Victoria Bowman picked up the honor winning the Most Unusual Bonnet category. Best Easter Bonnet went to Kathy Cordell of Bryn Mawr. 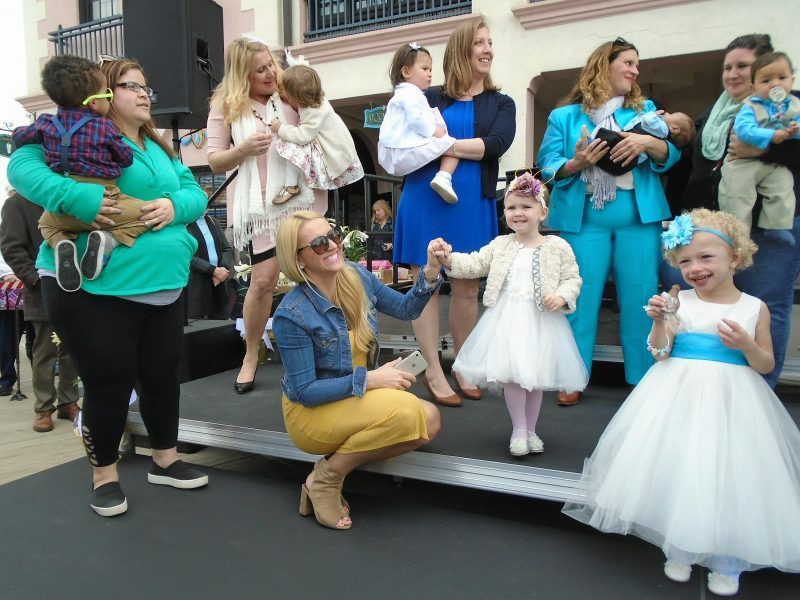 Best Dressed Family went to Austin and Victoria Sedicum and their children Florence, Faith and Fiona and their grandparents Kathy and Kenny Cordell. Victoria Bowman wins Most Unusual Bonnet for a second year in a row. Her brother Anthony supports the flip flop beach-inspired hat on his sister’s head. Mom and daughter are all smiles. A little contestant tells Michael Hartman, emcee his age. It was a real family affair for these contestants. 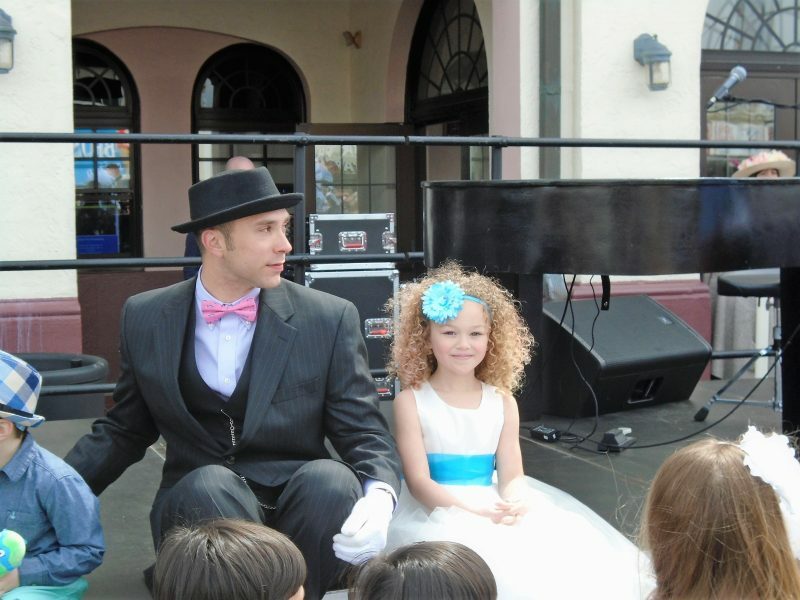 Emcee Michael Hartman with judges Miss Ocean City Madison Leigh Kennelly and Junior Miss Ocean City Hope Aita. 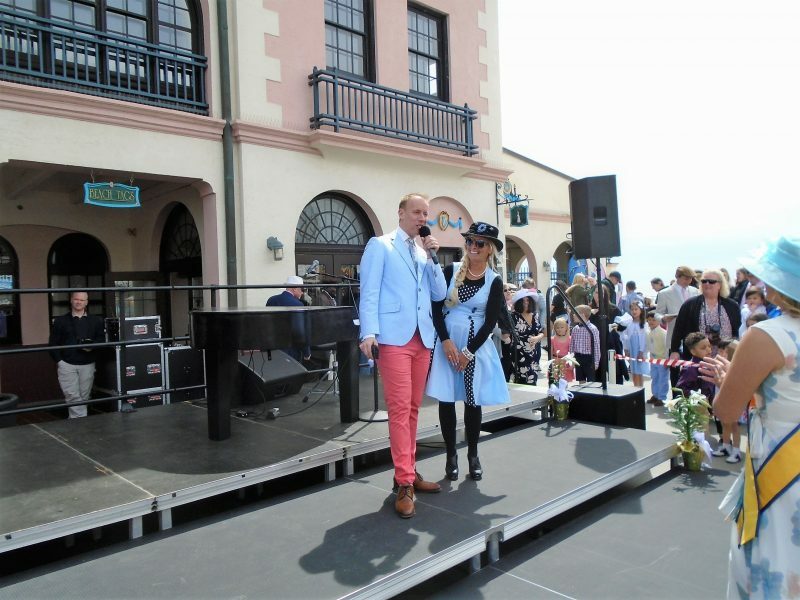 Emcee Michael Hartman jokes with Lori Lawrence, of Ocean City, who won Best Dressed Woman. 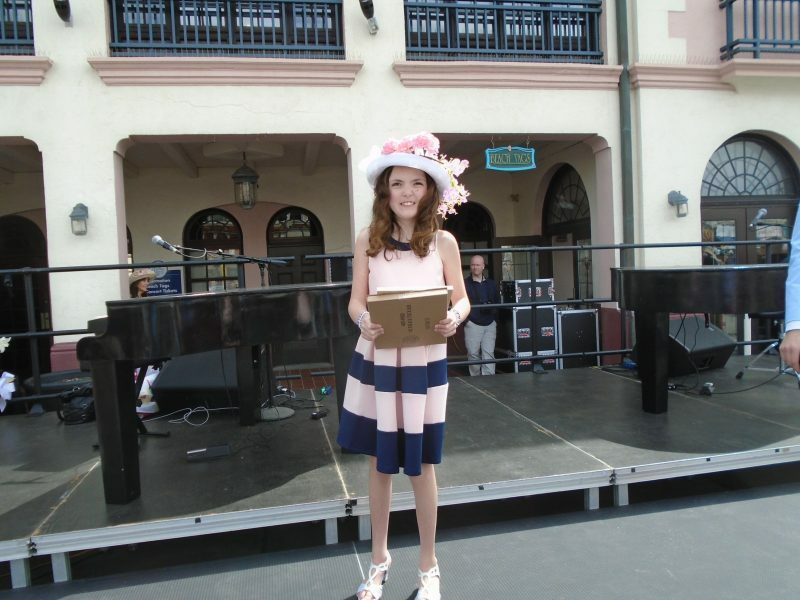 Maria Phillips of Philadelphia took Best Dressed Teen Female. Best Dressed Family went to Austin and Victoria Sedicum (pictured) and their children Florence, Faith and Fiona and their grandparents Kathy and Kenny Cordell. Kathy Cordell of Bryn Mawr took the prize for the Best Bonnet. Contestants smile as they wait for the next contestant to go on stage.